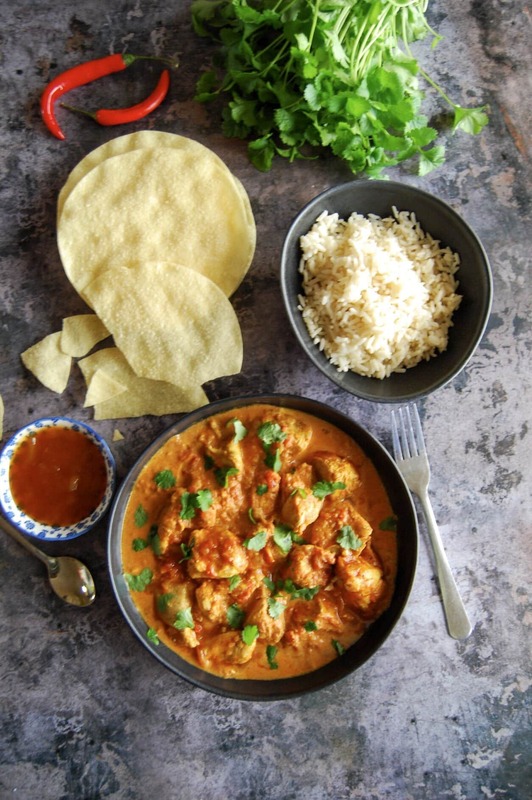 This mildly spiced, creamy slow cooker butter chicken is sure to become a family favourite! I’ve been craving really creamy, mildly spiced curries and rich, slow cooked beef casseroles lately – it must be the cold weather! So this week I pulled my slow cooker out from the depths of the cupboard (I do use it regularly, but there’s no room for it on my kitchen counter!) and made this gorgeous butter chicken. Now I’m not going to claim that this is an authentic butter chicken recipe because it isn’t – but it’s definitely delicious! I promise you will love it. My boys can be the fussiest eaters around, but when I served this on Monday night they licked their plates clean! If that’s not the sign of a good recipe, then I don’t know what is! 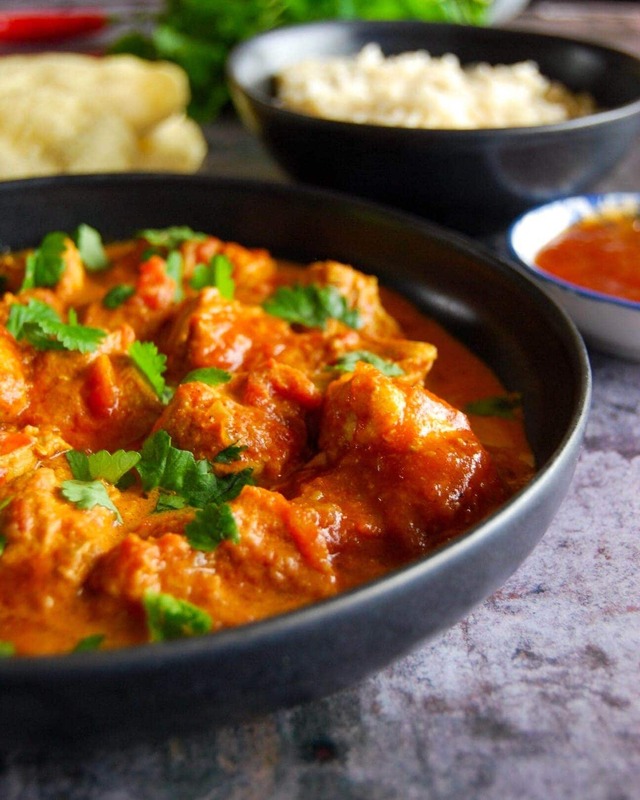 How do you make slow cooker butter chicken? It’s really simple. You start off by frying the chicken pieces off – I used chicken breasts. You could use bonless, skinless chicken thighs instead if you prefer. While the chicken is browning, blitz the onion, ginger and garlic together in a food processor or chopper unti you have a fine paste. If you have a pestle and mortar and don’t mind a bit of bashing (good for relieving the stresses of the day!) you can use that instead. Once the chicken pieces are nice and golden, remove them from the pan and set aside. Melt some butter in the pan and add your onion paste and spices and cook for a couple of minutes until your kitchen smells amazing! Then add chopped tomatoes, tomato puree, chicken stock, a little salt and sugar to the pan. Bring to the boil, then transfer everything to the slow cooker and leave it alone for a few hours. Then stir in some double cream just before serving. Naan bread is a must have for mopping up that creamy, spicy tomato sauce! Can I make this curry in advance? 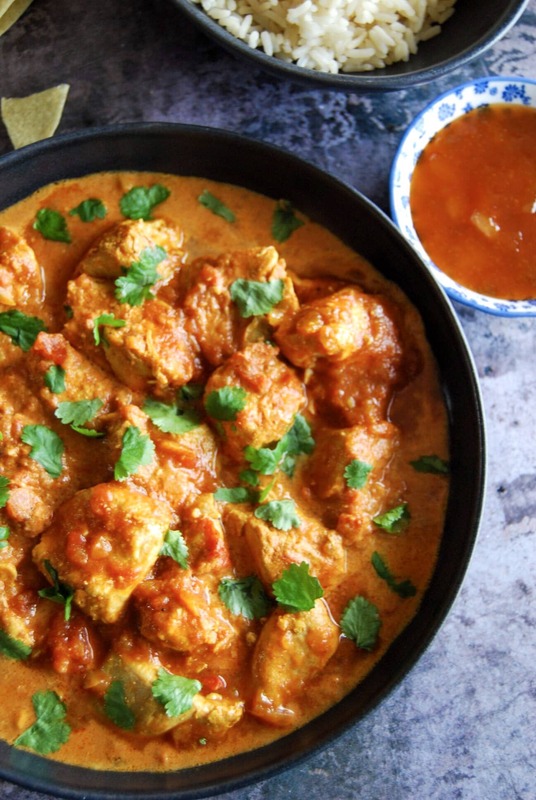 If you make this butter chicken recipe, I would love it if you would share a picture with me on Facebook or Instagram – or simply just leave a comment below. I’m sharing this recipe with #CookBlogShare, the weekly blog link up hosted this week by Jacqui at Recipes Made Easy. Pin this recipe for later.. This mildly spiced, creamy chicken curry is bound to be a huge hit with the whole family. Preheat the slow cooker if necessary. Blend the onion, garlic and ginger in a food processor. Heat the oil in a large sauce pan and add the chicken pieces. Cook over a high heat until the chicken has browned. Remove the chicken from the pan and set aside. Melt the butter in the sauce pan and add the onion, garlic and ginger paste. Cook on a medium heat until it is beginning to colour and smells fragrant. Stir in the chilli powder, Garam Masala, turmeric, cardamom pods and cinnamon. Cook for one minute, then add the chicken stock, chopped tomatoes, tomato purée, salt and sugar. Bring to the boil, stirring. Place the chicken pieces in the slow cooker, pour the sauce over the top (making sure the pieces of chicken are well covered with sauce) place the lid on top and cook on high for 4 hours or low for 7-8 hours. Stir in the cream. Remove the cardamom pods and sprinkle with chopped fresh coriander (if you don't despise it!) Serve with rice, Naan bread, poppadoms and mango chutney. Once cooked, this curry can be stored in the fridge for up to 3 days. Reheat until piping hot before serving. Would love to say this was delicious but they never left me any ? This looks like a delicious main dish! 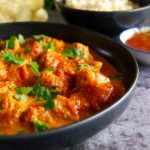 This looks so delicious, definitely the kind of curry I usually go for and love that you’ve made it in your slow cooker. It must be the season for slow cookers – I pulled mine out last week to make pork goulash. Love the sounds of this but I’m not keen on chicken breasts so would substitute for thighs. Agree that Naan to serve is a must. I can only imagine how good your house smelled while this was in the slow cooker. What a delicious looking recipe! This looks so good! I’m actually planning to make butter chicken tomorrow to update some old blog pics and your version sounds super tasty and I’m beginning to crave tomorrow’s dinner already! Thank you Cat! I’m using the slow cooker a lot at the moment. It did smell delicious, thank you! Thanks Corina! I’m looking forward to seeing yours ? Thanks Eb! It’s fantastic in the slow cooker! My boys would love this too – who cares if it’s authentic or not as long as it tastes great! That’s very true – thanks Mandy! Slow cookers are worth their weight in gold, aren’t they! Especially this time of year. I saw your pork goulash on Instastories – looked delicious!! Thank you Cat! 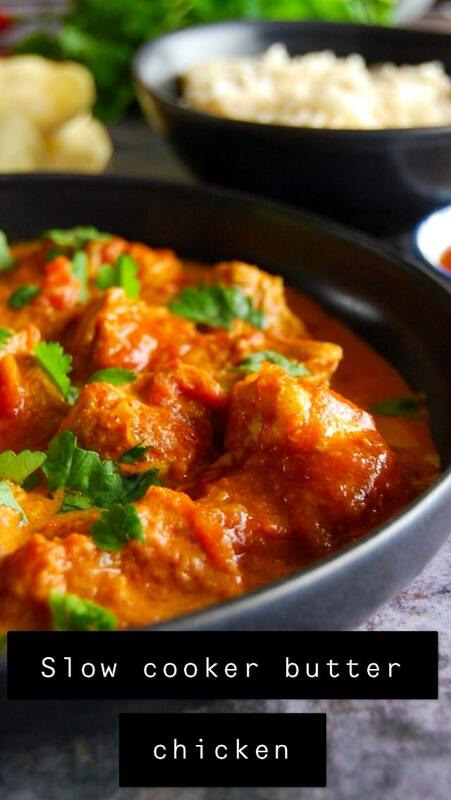 It’s one of our favourite curries. To me this curry as authentic as it can get. You know every family has its own variation and what suits your family the best is what you make. You’ve added all the aromatic spices that go into a curry.